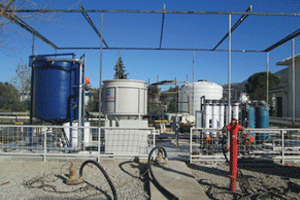 Our aim is to recover the chemical wastewater in İzmir Aygaz Işıkkent Filling Facilities. The filling and leakage controls of small cylinders, home cylinders of 12kg and industrial cylinders are performed in the plant. After they are used, the cylinders are gathered by the dealers and brought to the factory in order to be washed and cleaned and colored in the painting booths, if their colors are worn-out. During paint spraying in the painting booths, the excess paint mixes with the water through the water-screen circulated in the booth. When the circulated water reaches a certain level of dirtiness, it is delivered to the chemical wastewater treatment facility. Within the scope of this project, the aim is to establish a recovery system in order to use the industrial wastewater derived in Aygaz A.Ş. Işıkkent Filling Facilities in the process after being treated in the chemical wastewater treatment facility. An improvement has been provided in the present chemical wastewater treatment facility by replacing worn out equipment with new pieces. The recovery of the water filtered after being chemically treated will be provided with an additional ultrafiltration system and by increasing the water quality. The wastewater derived from the process is discharged primarily to the balancing pond. The water is ventilated in the balancing pond and delivered to the Reaction tank via Wastewater Lift Pumps with a specific automation. 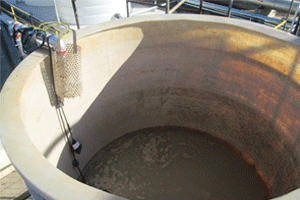 Thanks to the mixer, the flocculation process is applied to the coagulated wastewater in the reaction tank. After the flocculation process, the sedimentation of the wastewater is provided by controlling the time duration set on the PLC device and the treated water is transmitted to the balancing pond via the butterfly valve with automatic actuator. The sludge is delivered to the Sludge Thickening Tank to be thickened through the Sludge Pump. In order to dehydrate the thickened sludge, it is transferred into a Filter Press unit via the Sludge Feed Pump. The water filtered from the filter press unit is delivered to the Balancing Pool with gravity in order to be treated again. Dehydrated sludge is removed in compliance with the relevant regulations under the supervision of the operator. In order to apply the rough filtration, the treated water is filtered through the Separator Filter with the automatic blowdown system. Following the filtration process with the Separator Filter, the water is filtered through the Sand Filter with Automatic Backwash and Carbon Filters in order to perform fine filtration and it is filtered from the Disk Filter prior to Ultrafiltration so as to carry out the microfiltration process. 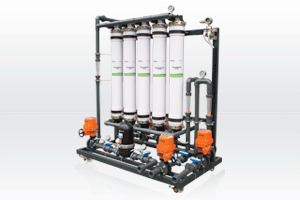 Following the disc filtration, the Ultrafiltration System is used to provide the recovery process. The ultrafiltration System removes unwanted contamination in the water and performs the backwashing processes with the automation controlled backwash pumps according to the differential pressure. The treated water is then transferred to a clean water tank. The clean water is discharged to the İZSU channel by conducting ORP-controlled chlorine dosing via chlorine measuring and a dosing system running to the clean water tank. Designed by our engineers at A.O Smith, this system has enabled wastewater recovery and water-saving. Our project was designed and produced in our office in Izmir, Turkey, and delivered to Işıkkent in Izmir, Turkey. The system was operated following the onsite installation, required controls and personnel training performed by the expert engineers of A.O. Smith.